Use foods to boost immune system function! Learn how garlic, lemon juice and kefir can improve your health. The health and medicinal benefits of garlic, benefits of lemon juice and probiotic kefir all enhance the immune system. While it is known that eating well is related to good health, certain foods are, of course, better than others. While consistently eating some or all of the 10 healthiest foods rich in antioxidants and foods naturally high in the eight glyconutrinets, some foods specifically enhance the activities of the human body's immune system. The immune system is a wonderful invention to fight off disease - when it's not working at optimum levels it can cause you to feel slugish and get sick more often. Three of the best foods to boost immune system are lemon juice, preferably, organic lemon juice and garlic and fermented milk called kefir. If you're looking for more ways to boost your immune system, increase your energy level and improve your overall health in an all natural way you'll want to check out these 15 simple things to do to supercharge your immune system. Garlic is a member of the onion family. It is has an aromatic and strongly flavored bulb called the head composed of several sections called cloves. Garlic has long been prized for its use in cooking and as a medicine. The effects of garlic for lowering cholesterol and its cancer-protective effects has been established by modern scientific methods. Since garlic is prized in both folklore (To ward off vampires!) and fact, to ward off diseases, it should be of no surprise that this is an effective food to boost immune system function. Garlic acts as a natural antibiotic. Health magazine published a testimony of a woman who hasn’t had a cold since 1992 and credits this remarkable accomplishment to her daily ritual of eating a clove of garlic every morning with breakfast. Chopping up a fresh clove of garlic and swallowing it like a pill or cooking with plenty of garlic will give you immune-boosting power or try or try odorless garlic oil if you're concerned about bad breath or don't like the flavor of garlic. What makes garlic such an effective antibiotic is the allicin in it. Allicin is released when the clove is crushed or cut, so unless you intend to chew the clove, cut or crush it to release the antibiotic goodness. Perhaps the cheapest and most effective way to get your garlic goodness is simply to buy the fresh garlic bulbs but you can also find odorless garlic oil at Botanic Choice for a great price ! Other foods to boost immune system function include lemon juice. Drinking real lemon juice, preferably, organic lemon juice with water is very beneficial to balancing the pH of the human body. Ph definition is simply how acidic or basic a substance may be. Although this may not be, at first glance, associated with the immune system, it certainly is! The human body pH ideally should be in the range of 6.5 to 7.5. Because of an overabundance of processed non-nutritive, chemical-laden foods, most people are very acidic. That is why most people have a low pH and are very acidic. It is in this acidic environment Cancer cells grow rapidly in the presence of an acidic pH. The immune system has to work harder to kill harmful cells, which are happily growing in the acidic environment. Drinking lemon juice and water with a bit of natural sweetener (I prefer stevia instead of sugar), not only yields a refreshing drink, but actually helps to raise the body’s internal pH. If you actively want to balance your pH, test yourself approximately twice a week. Testing your pH is simple. Just buy ph test strips and hold them under your first morning’s urine. Compare the color of the test strip to the color chart on the pH strip package. Ideally your pH to be about 7.0. Although not as well known as perhaps garlic, kefir ranks high on the list of foods to boost immune system function. Kefir is milk that is fermented with kefir grains. Kefir grains are a living unit of beneficial yeasts and bacteria. The resulting kefir grain-infused milk known as kefir is a highly nutritious probiotic drink. Here is a picture of the kefir grains being lifted out of the finished kefir. 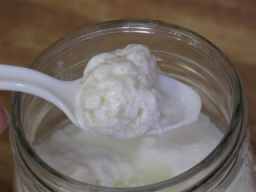 Ancient peoples drank kefir for good health and longevity. Obviously they used kefir as one of the foods to boost immune system function. Scientific studies as reported by the Food Science Bulletin proves the wellness effects of kefir. Laboratory and animal studies found that the unique blend of beneficial yeasts and bacteria found in kefir grains has properties that fight fungus, viruses, and even cancer. Kefir also has beneficial antioxidants that protect cells from aging and disease. Kefir is also has a very low pH which like lemon juice helps to prevent the the “bad bacteria”. The reason why kefir is one of the foods to boost immune system function is because it is rich in probiotics. According to kefir enthusiasts, kefir's ability to boost the immune system is just the beginning of the long list of kefir health benefits Adding kefir to your daily diet is a safe, inexpensive, delicious and a proactive move to enhance your overall health. Drinking kefir will give your immune system a boost against not only annoying colds and flu but also possibly against more serious and debilitating diseases. If the ancients were right, kefir gave them vibrant health and longevity. You too can tap into ancient wellness secrets by drinking kefir. OK, if you do not want to add garlic, lemons and/or kefir to your daily diet, there are other, perhaps more practical ways for you to boost your immune system. They are food supplements. Here are two of my favorite food supplements that will effectively boost your immune system. Super Berry Complex by Botanic Choice - It includes the immune boosting benefits of six different types of berries plus noni fruit and pomegranate. Much research has been done on berries and pomegranate benefits and the latest research on the immune boosting power of the noni fruit is exciting! Probiotic Supreme by Botanic Choice - It adds helpful bacteria into your digestive tract. Since over 80% of your immune function is provided by your intestines this probiotic with one billion live organisms can make a big difference in your immune system function.